I’m happy to report on behalf of the Canadian Comic Book Creator Awards Organization that we have agreed in principle with the organizers of the Montreal Comic Con and will be presenting the 8th Annual Joe Shuster Awards in conjunction with that event on the evening of Saturday, September 15, 2012. In preparation for the ceremony, the CCBCAA will be working with members of the comics community to provide a fully bilingual awards ceremony, and we are all excited at the possibilities of providing better translation services on this site in order to help spread the word on comics and graphic novels by Canadians in both official languages. 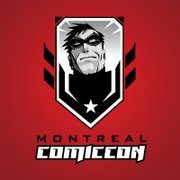 The Montreal Comic Con will be held on the weekend of September 14-16, 2012. Due to unexpected demand, the MCC will be expanding to a full three days in 2012. The MCC will also be changing facilities in 2012. It will no longer be held at Place Bonaventure but will be moving into the newer, larger and more colourful (!) 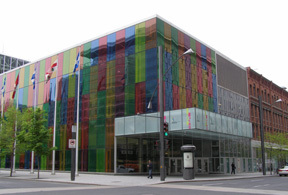 convention facilities at the Palais des Congrès in Montreal, QC (pictured, right). This marks the second time that the Joe Shuster Awards will be presented outside of Toronto. Earlier this year we presented the 7th Annual Awards at the Calgary Comic & Entertainment Expo. Plans are for the JSAs to be presented in conjunction with a different comic book convention in Canada each year. This entry was posted in 2011 Releases, Canadian Heroes, Comics For Kids, Fundraising, Gene Day Award, General Announcements, General News, Hall of Fame, Happenings, Nominating, Press Releases, Publishers, Retailers, Webcomic by Kevin A. Boyd. Bookmark the permalink.